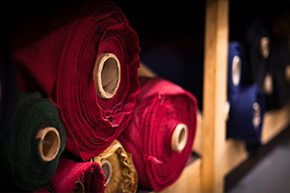 Velours are traditionally a picked fabric. The face side has hundreds of tiny tufts, or piles, per square inch. It looks like what non-theatre people call velvet. While not really a velour, some premium sanded fabrics are used in place of, and thus referred to as, velour. One of the more popular is Encore, an exceptional stage fabric with a tight opaque weave. Rather than having the velour style piles it is sanded, creating a fuzzy, felt-like finish. From a short distance away, it is virtually impossible to tell the difference. Repp fabrics are less expensive than velours and have a woven Herringbone pattern to them. They provide modest light blocking and sound dampening. They are useful in small theatres, and Doral Opaque, a vinyl backed version, is exceptionally well suited for elementary schools and theatres with young talent, as it can be easily wiped clean with a damp sponge. For Rear Setting curtains, that are typically black, Prism is usually a far superior choice over a Repp fabric and is roughly the same cost.